Amagical place that allows you to disconnect from the outside world and to experience moments of pure relaxation. 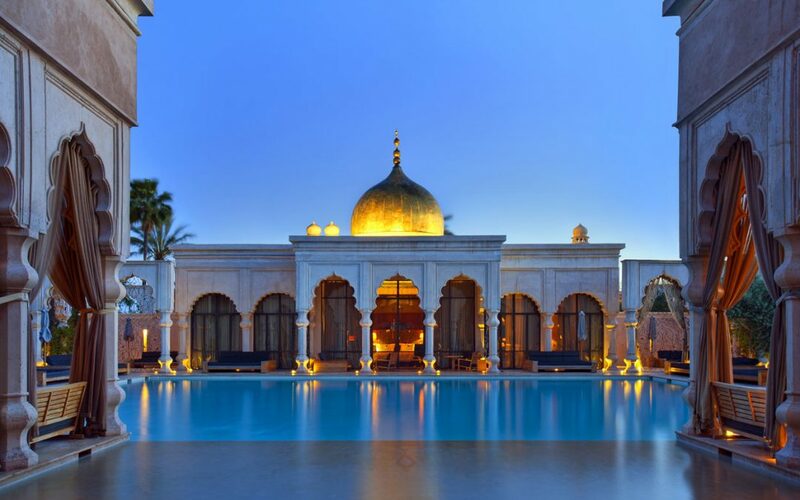 Infinite perspectives, multiple patios lined with orangeries and the pools, filled with rose petals bring the Moorish and Andalusian cultures together to a beautiful oasis of peace… and luxury. The Namaskar Palace offers 41 accommodations: rooms, three types of suites, two styles of villas and three extraordinary Palaces. All are equipped with a private pool or a heated pool, spacious bathrooms and outdoor bathtubs, as well as the latest technology! The villas also have private gardens, while the palaces include private kitchens and Butler services. In order to create personalized living spaces, some rooms and suites can be joined together. The Pool Villas are nestled in the heart of another peaceful haven and are connected by exquisitely scented walkways. Large bay windows open onto the private gardens and allow light to flood in on the 127, 210 or 460 m2 of the different villas, all with heated pools of course, while others have a direct access to the hotel pool. Luxury when you hold us… The crown jewel? The Villa Namaskar: three bedrooms, each with a king size bed, a walk-in closet and an en-suite-bathroom. A dream setting to sublimate these 487 m2. The private garden is 1,200 m2 and includes an ornamental pool and a large heated pool. We reckon that you’ll be… comfortable! This Palace has received countless awards as has its splendid spa. Located 25 min. from the Jemaa el Fna square, the place is a dream of luxury, tranquillity and harmony.